At Mary, Mother of Hope Junior National School we strive to create a centre of educational excellence for the children in our school by delivering a broad and exciting curriculum. Each section of this page contains tips for helping your child in the subject. Active learning involves children learning by doing things. We aim to support our children in their learning and development. We incorporate several programmes based on principles of active learning into our curriculum. Aistear is the early childhood curriculum framework for all children from birth to six years in Ireland. Click on the link to find out more. reversals, spacing and letter formation problems. Junior Infants will begin by learning all upper case letters, followed by lower case letters. For more information about the Junior Infant programme, click here. Senior Infants begin with the lower case letters and then revisit all upper case letters. For more information about the Senior Infant Programme, please click here. Jolly Phonics is a multi sensory phonics programme which teaches 42 letter sounds through a story, song, action and sound. In Junior and Senior Infants the boys and girls learn all 42 letter sounds. The letter sounds are grouped to support the children in blending sounds together to make words. sounds along with "tricky words" that do not follow the phonics rules. Maths is taught using a discovery lead approach aimed at supporting children's understanding of maths concepts while making connections with the real world. 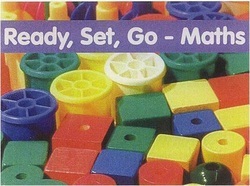 Junior and Senior Infants are supported in their learning through games and activities from the Ready Set Go Maths Programme. Helping your Junior or Senior Infant child with maths - tips and video clips. wide range of resources and games. Helping your 1st or 2nd Class child with maths - tips and video clips. This year, we are introducing a new initiative called "Literacy Hour" into Senior Infants, 1st Class and 2nd Class. During Literacy Hour, a link teacher (Language/Learning Support/Resource Teacher) will work with the class teacher to help the children develop their literacy skills. The hour session is broken into four different stations. All of the children spend 15 minutes at each station; two of the stations are designed for independent work, at another the boys and girls complete process writing with a teacher and at the last table, the teacher listens to the children reading.